This topic describes how to use the Tizen Studio to build TV application projects that include Native Client modules. Define the NaCl toolchain and build configuration separately for each NaCl module in the application. If you have multiple modules, they do not need to use the same toolchain or build configuration. For more information, see Building NaCl Projects. 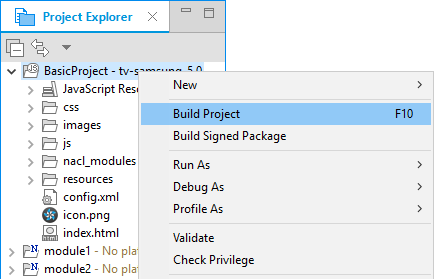 In the "Project Explorer" view, right-click the TV application project and select "Build Project". The TV application project is built. Build artifacts for each NaCl module can be found in the "CurrentBin" directory within the module's project. In the "Project Explorer" view, right-click the NaCl project and select "Index > Rebuild". 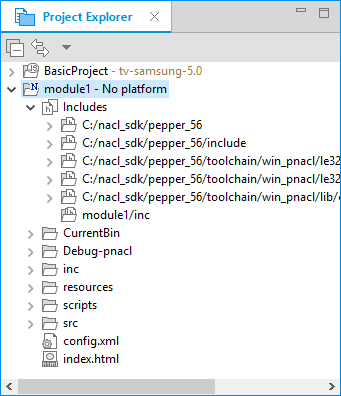 Check that the toolchain directories are included in the NaCl project. 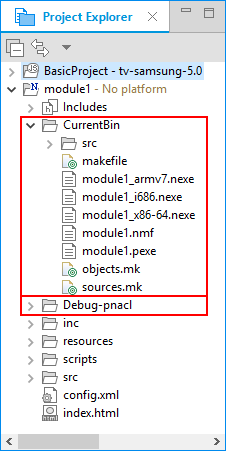 In the "Project Explorer" view, within the NaCl project, expand the "Includes" folder. Make sure that "pepper_xx/toolchain" directories are present.